This is another of those books that I skipped over. I love ancient themed books, especially romance books, and it doesn't matter whether it is female/male or male/male, I just love the time. But I thought, since I am giving everything else a try I will give this one a try. WARNING! This whole area probably contains spoilers because my thoughts are so confused about this book there is no way I can break everything up evenly into sections. This book surprised me. Looking back on the rating that I gave it on Goodreads I might have to change it because the more I think about this book the more stars I feel it earns.The book is really interesting especially when Saevius is put in the position of having to choose between masters. I mean from the synopsis we knew that that would happen, but when you see everything that he goes through while trying to pick between the two, and the moment he realizes that no matter what choice he makes it will probably lead to his death. And the hazing of the gladiators. I never really thought about it, but when you really think about it, of course it makes sense that there is hazing. With that many men, and their lives depending on who garners the most favor, I am surprised that they backed off of Saevius. But I do have to get to the most interesting character in the book, the one who put me off the book, but the more I think about him, the more he becomes my favorite character. That's right, I'm talking about Drusus. Oh, you thought I was talking about Calvus? Yeah, right.... but I'll get into that later. Drusus, man, I don't even know where to start. I am going to start with the fact that DRUSUS WAS BORN A GIRL! I was so pissed off when I found that out, I felt horrible betrayed by the author. The funny thing was, about halfway through the book I thought, wait a minute, and I went onto Goodreads to check and see if this book was on any strait or transgender romance lists. Because I was like, Drusus is a girl and that's why he won't take his armor off. But because it wasn't on any of those lists I thought I was imagining it. Now, before you get all up in arms and say I am intolerant, or something of the sort, let me say that the reason I was upset wasn't because Drusus was transgender, but because I felt the author tricked me, and not in a kind interesting way, because in the moment of the reveal i felt not only my doubt that the romance between Saevius and Drusus might not last because of this, but we are also shown Saevius' doubt. I felt it was too cruel to the characters. So I was super pissed off about it, and somehow managed to finish the book, which was pretty ambiguous about where the relationship will go, I mean they exchange kisses and such, but i kept wondering if it would be the same. Then after finishing the book, I thought, why wouldn't it? Drusus is male, in his thoughts and feeling and actions he is male, that is what is important, and that is what Saevius was attracted to, right? So they will be fine. But it just kept bothering and I couldn't put my finger on why until I thought about Kaeso. That is what left me feeling uneasy, it shouldn't have but it did. It was because L.A. Witt, forced me to face this strange combination of man and mother that Drusus was and for some reason it took a while for my mind to fully come to terms with that. I kept arguing with myself that a father would act the same towards a child, no parent wants their child to be abused. But the way that Witt wrote about Drusus' need to save the child seemed wildly maternal (at least it seemed this way to me). And then Saevius kept commenting on how Kaeso looked like Drusus, which felt like Witt was trying to force Drusus' femininity down my throat. It was hard for me to read and I really struggled to come to terms with it. But I kept thinking, this happens to people in real life, it's not just a dramatic move on the part of the author, a transgender man can have a child and that doesn't change anything. Well, now I have come to terms with it and that strange dichotomy makes Drusus such an interesting character that I cant stop thinking about him, and I like him more and more. He is definitely the shining star of this book. Now on to Calvus. What. A. Jerk. That being said, The title confused be at first, because I was sure that Drusus was the one that Saevius would come to respect but then I was like maybe he is going to reveal a side of Calvus that no one knows and I kept waiting for it, but it never happened. Calvus is in the book so little (though his shadow does hang over Saevius) that I felt it was a bit strange for his name to be in the title. I understand the reference to the left hand, how it is the evil hand and shouldn't be trusted. But, I don't know, I wish that it had a different name. I feel like I keep complaining about this book, but really I did enjoy it! 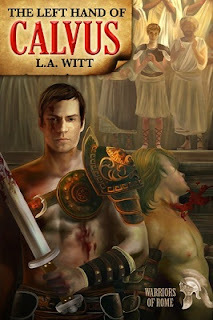 I am still debating reading other books by Witt, I don't want another curveball thrown at me, though maybe I should look forward to that because sometimes I do get a little stuck in the formulaic plots of many romance novels. If you guys think I should continue of with the Warriors of Rome series let me know! I give it a 3 out of 5 stars for now... It might go up the more I think about it! Don't be shy, though! Leave some comments, I would love to hear what you think! If you have any questions or requests you can reach me at mizreader@gmail.com or on twitter @miz_reader. Share book reviews and ratings with Kelsea (Miz. Reader), and even join a book club on Goodreads.